There’s something innately primal about fire. Since the dawn of mankind, people have gathered around fire not only for its warmth and light, but to share life’s experiences. For this reason, fire’s cozy warmth and light has been popularly added to modern landscape design in the form of fire pits, outdoor fireplaces and various fire features. Adding a fire pit or outdoor fireplace to your backyard or pool area will not only fill your outdoor spaces with flickering nighttime beauty. These fire features can add safety as they illuminate nearby surfaces such as patios and walkways. The addition of a fire pit or outdoor fireplace also means your outdoor living areas can be used more hours of the day and a greater percentage of the year. Our Registered Landscape Architect will be happy to discuss options for a unique, custom-built fire pit or outdoor fireplace in your landscape design. These options each have their individual charm and can be crafted to complement your home and adjacent outdoor living areas. Adding an outdoor fireplace not only adds warmth and light, but can provide a stunning accent piece that can be viewed from almost any spot in your backyard. Outdoor fireplaces often become the focal point of lounging or dining areas, and can also be utilized to mounting televisions and other decor. Options for these fire features abound, including material choices, fuel sources, the inclusion of wood storage and more. 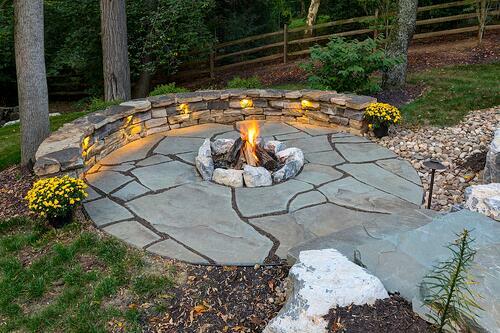 Fire pits can be constructed from either natural stone or manufactured materials. These materials allow for customization as various textures, stone sizes, and colors can be combined to create a fire pit that your family and guests will love to congregate around. Fire pits can be either gas or wood fueled and can either be standalone features or incorporated into the surface of patios nearby, adding warmth and light to dining areas and a nearby pool or spa. At Earth, Turf, & Wood, we’ve had many years of experience designing and creating some of our area’s hottest fire features. 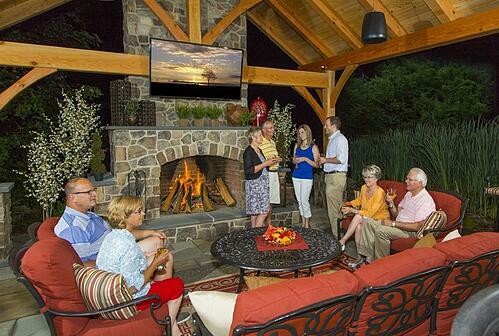 Take a few moments and look below at pictures of outdoor fireplaces and fire pits we’ve added to properties in Reading, York, Hershey, Lebanon and Lancaster, PA. When you’re ready to talk about transforming your backyard, feel free to request a consultation.